Pink mountain-heather on Mt. Buxton, Calvert Island. Photo by Abe Lloyd. Pink mountain-heather is a low-lying shrub with small needle-like leaves and stems that grow upwards to 40 cm tall. When in flower, the pink bell-like flowers are the key identifying aspect of this species, which is more common than the similar yellow mountain-heather. They are found at the top of a hairy stem, in groups of one to many. There are several similar mountain-heathers in the region; see 'Similar Species' to tell these apart. Pink mountain-heather is found in subalpine to alpine environments, though it may be found in rocky sites within coniferous forests as well. The species is common across BC, except for Haida Gwaii and the northeastern part of the province. It is found south along the coast to California, inland to Idaho and Montana, and north to the Yukon and Northwest Territories, and parts of Alberta. Many species of mountain-heather may grow in close proximity and are very similar, including Alaskan mountain-heather and yellow mountain-heather. These species can be very hard to tell apart when not in flower. 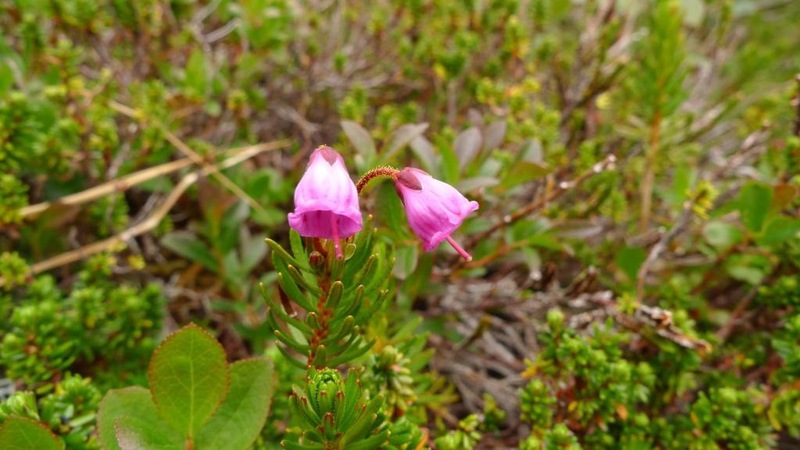 Alaskan mountain-heather has bell-shaped flowers like pink mountain-heather, but they are white and the stems are not as hairy. Yellow mountain-heather has hairy stems but yellow urn-shaped flowers. Alaskan mountain-heather has leaves that are rounded on the underside, rather than grooved, like pink and yellow mountain-heather. To make matters more complicated, pink and yellow mountain-heather can sometimes hybridize and form a species termed Phyllodoce intermedia. Another species that is quite similar is white mountain-heather. It's leaves are more scale-like, however, which sets it apart. Crowberry is yet another species that looks quite similar to the mountain-heathers, but it has very small and inconspicuous flowers and smaller, shorter leaves. Pink mountain-heather, and the other mountain-heathers, are not true heather, but just resemble it. Pojar, J. and MacKinnon, A. (2005). Plants of Coastal British Columbia, Revised. Vancouver, BC: Lone Pine Publishing. P. 63.